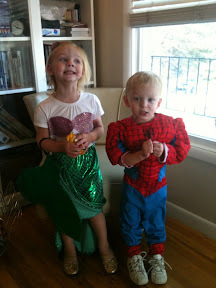 Claire and Noble had their first "real" Halloween this year. They absolutely loved it! 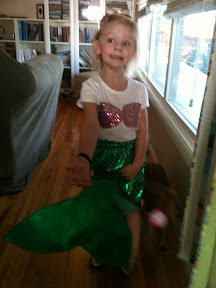 Claire was our mermaid. It only took Noble about 2 houses when we went trick or treating to realize what was going on before he started trying to run from house to house. At the end I think I heard "just one more" about 15 times. 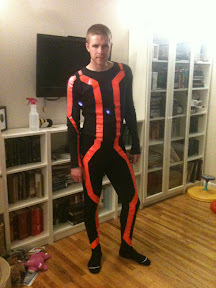 For the annual Davis Halloween party Mike and I went as people from Tron. They came out pretty good, seeing as we started the morning of. All in all it was a fun Halloween, especially for the kids! So cute! Did you make all of them too? 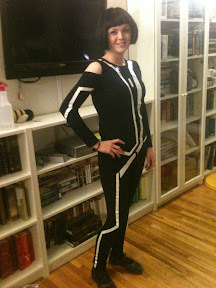 I bet you did with all of your sewing talents. Looks like you had a blast!